Dr. Rachel Mismas is a Las Vegas native and grew up on Nellis Air Force Base and Sunrise Mountain in NE Las Vegas. Dr. Mismas graduated from UNLV with honors majoring in Biology and minoring in Chemistry. She eventually moved to sunny California to pursue her passion for dentistry at the USC School of Dentistry where she completed additional coursework in anesthesia, oral surgery and pediatrics. Dr. Mismas was one of a few students selected to travel internationally and provide needed dental services through USC's "Ayuda" program. Dr. Mismas maintained her practice for 9 years - in private practice, community clinics and as volunteer faculty at the USC Herman Ostow School of Dentistry. "I have mixed emotions about leaving Los Angeles but my son and I both need to be closer to my family. I'm really looking forward to seeing them every day." Eventually, the sunnier skies of Las Vegas could no longer keep Dr. Mismas away and she is here to stay. Dr. Mismas takes continuing education courses to stay educated on new procedures and technologies. 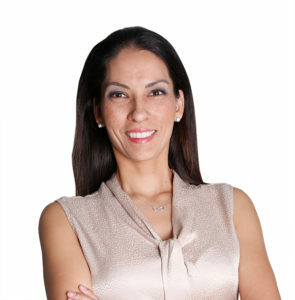 Dr. Mismas's dental office, Divine Dental, is not only a product of her passion for dentistry but also an extension of her passion for helping others. "It really is a a great life to have an opportunity to help others every day." Some notable details about Dr. Mismas -- Her father used to play a Klingon for Star Trek, she tries her best at speaking Spanglish 🙂 and her favorite dish is Fesenjan.